Microsoft has released a second Office 2010 guide, after the previously released Getting Started With Microsoft Office 2010 Guide. The initial guide was designed for administrators and also end users alike and provided them with information about the changes and new features of Microsoft Office 2010 and applications such as Word 2010 or Excel 2010. The new guide is intended for administrators and organizations who deploy Office in networks and focuses as such on administrative templates. Group Policy information, applying updates or customizing installations of Office 2001. 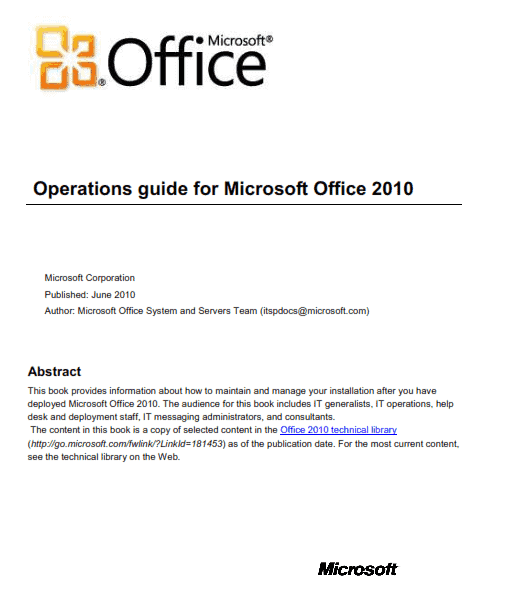 The new guide, Operations guide for Microsoft Office 2010, provides information on how to maintain and manage Office 2010 in an organization. It is in this regard even more specialized than the getting started guide; the audience is limited to IT workers and administrators who manage Office 2010 in a computer network. The guide has been published in doc, pdf and xps formats: it has a total file size between 226 Kilobytes and 522 Kilobytes depending on the selected format. The relatively short size of the guide could convince some system administrators to skip it completely. The guide is however filled with hyperlinks to Microsoft websites that offer detailed information about concepts addressed in the guide. All three different formats of the operation guides for Microsoft Office 2010 can be downloaded from the official Microsoft Download Center. Microsoft published the Operations Guide For Microsoft Office 2010 for system administrators and organizations recently.